In this wonderfully dark and cryptic passage in Mark, Jesus tells his disciples two very important things. 1) Don’t be a stumbling block especially to the young believers. But instead 2.) be the salt of the earth. The reading also talks of hell. Or what the original Greek text refers to as Gehenna…the garbage dump outside Jerusalem. While we should not overlook what might happen to us if we chose to ignore Jesus’ warning I think we’d miss the more important lesson here if we only focused on that. Jesus is warning us not to be the stumbling blocks that cause us to be thrown away in the trash. What is Jesus warning us about? A simplest way to think about it might be like this…Let’s say you have cancer. What do you do? You really have two choices. You can leave it in or cut it out. (tell my cancer story) For me it was an easy decision to cut it out. The stumbling block is a metaphor for the toxic cancer that invades our faith and causes others to stumble or fall away from God. To that Jesus says…cut it out. It’s that simple. I’M NOT A STUMBLING BLOCK, AM I? Let’s look at this from another side…Perhaps you have cancerous behaviors that cause people to stumble. Take smoking for an example. It’s your right. It’s your business. Yet your decision to smoke does affect others around you. I’m not just talking about the effects of breathing in second hand smoke. Research is pretty clear that if small child watches you smoke, it increases their chance of taking up the habit by 40%. This is true on many levels. I have three kids at home. Each one watching carefully everything I do. Now maybe smoking isn’t your stumbling block. Maybe it’s your negativity, Or you’re holding onto resentment and pent up anger. It could be greed, lust, cheating in business, or on your spouse. Maybe it’s telling little white lies. Some of these things might seem harmless to you, but what about the person on the receiving end? Jesus says if your actions cause another person to fall away from their faith that’s not good! In fact…it’s really bad! Again Jesus gives us two choices. Continue with our corrosive behaviors. Or cut it out. One, Jesus says, leads to death but the other to eternal life. BUT GOD’S ON MY SIDE, RIGHT? Okay, so let’s assume we’re all Christians here today. And let’s say the cancer is a group of people right here in our church. We discover that their actions and behaviors have pushed others away from attending our worship service. What do we do as a church? Should we let the infection spread throughout the body of Christ? Or do we faithfully follow Jesus, who said tear out those things that cause us to stumble? I know of a church that has lost three ministers and hundreds of people in the last five years all because of a few people who decided their will was more important than following God’s will. Society has made it way too easy and acceptable for people to remove themselves from the problem, instead of removing the problem itself. This is not healthy, especially when it’s a church that is affected. As long as studies continue to report how people are abandoning church in droves, we’ve got our work cut out. I have learned many leave frustrated or hurt, often with a tainted view of faith and God…simply because of the cancers within Christianity. And this is exactly why Jesus warns us in such gruesome detail, “It’s better to lose one hand and enter life maimed, than it is to have two hands that will lead you to your destruction.” We have to cut it out. We have to because…The world is watching. There are some who are just watching and waiting for us to stumble. And we are. The Dugger’s reality show, “Too many kids and counting,” is a great reminder of what can happen when one Christian doesn’t practice what he preaches. His sexual behavior became a stumbling block that affected all Christians, directly and indirectly. When his story was exposed the good news becomes bad news. But…the world is watching…because there are also people out there who are seeking a higher truth. They are hurt and broken, in need of finding real meaning to their lives. People who need grace and love…redemption and peace. They may look to Christianity for answers. If we preach that Christ is the cure for the cancers corroding our world, then we better make sure our actions line up with Christ. Our light must be the light that helps others find their way back to God’s open arms of love. If we are guilty of distorting the Good News, then cancer wins. If we fail to love all people, then cancer wins. If we are quick to pronounce judgment on others while ignoring our own sins, then we become the cancer, not the cure. We become the ones God cuts out and tosses away into the trash were worms never die and the fire never ceases. We make our own hell…right here on earth. WELL THEN, WHAT CAN I DO? I believe it comes down to this. Don’t be the cancer, be the cure. Begin to cut out those things in life that cause you to stumble and fall. Work hard to ensure that when you do fall, you don’t take others with you. Stay focused on Jesus and not on you. Instead of chasing people away, invite them in to your life to see what Christ’s love is all about. When a person is down…lift him up. When they are hungry or sick…care for them. Jesus tells his disciples to, “have salt in yourselves and be at peace with one another.” It’s not by accident he uses the metaphor of salt either. Look at this picture of a hotel in the salt flats of Bolivia. 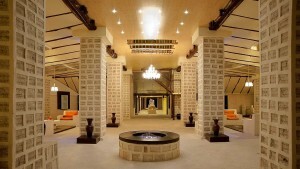 Most of the structure and the furnishings are made from salt. I’d like to think that if those tiny crystals in our saltshakers are strong enough to be building blocks for such a magnificent place, then I imagine being “the salt of the earth” can make us strong enough to be the stepping-stones that lead people to a much more heavenly place. When Jesus spoke these words, salt was a precious commodity. You might know it was used for flavoring and preserving, for medicinal purposes, as well as for bartering. The Roman’s actually rationed salt as part of a soldier’s pay. But did you know salt was also very important in Hebrew worship. By Jewish law, grain offerings, burnt offerings, and incense all had to be salted. Salt was also used to ratify covenants, including God’s Covenants with His people. And course Moses used it liberally as a means to make his mother-in-law’s cooking edible. There is a good reason why Jesus wants us, his disciples, to be the salt. Salt purifies our faith instead of polluting it. It cleanses our community, instead of contaminating it. It preserves God’s covenant with the world, instead of breaking it. Jesus wants us all to be blocks of salt which can be cut into stepping-stones. WHAT IS THE KEY TO BECOMING LIKE SALT? If we abide in the love of Jesus, then we will follow Jesus who removes the stumbling blocks. If we abide in the love of Jesus, then the Holy Spirit empowers us to love one another. If we abide in the love of Jesus, know this we might stumble and fall from time to time. And that’s okay. Christ is there to pick you up. Let me leave you with this reminder, even in our stumbling the world is given a chance to see God’s grace at work. Salt, by its very nature, crumbles, but just the same…it can also be reformed. As I was looking online I found a poem that I believe brings this message home. A stumbling block, or a stepping stone? Cancer or the cure? Today, I’d like you to spend some time thinking about which one you wish to be. Amen.